It has been revealed that Bandai Spirits will officially merge with Banpresto as they dissolve. Last month’s issue of National Printing Bureau’s Kanpō magazine, dated February 22nd, has revealed that toy company Banpresto has dissolved and will be merged with Bandai Spirits, Bandai Namco’s toys and hobby subsidiary. Bandai Spirits now own all rights and duties formally belonging to Banpresto. Bandai Spirits was established on February 15th, 2018 by Bandai Namco as a subsidiary which absorbed the figure and plastic model side of the business and the convenience store goods business from Banpresto . The company had a capital stock of 100 million yen (about £692,000.06 in GBP) and about 450 employees at the time of it’s establishment. Banpresto was founded as Hoei Sangyo, Co. Ltd. in 1977, and the company was renamed as Coreland in 1982. They then became a partially owned subsidiary of Bandai Namco in 1989 which is how they gained their most recent name. Banpresto became a wholly owned subsidiary of Bandai Namco in 2006. What do you think of the move by Bandai Namco? Are you excited for the potential toy opportunities? Let us know on our social media pages! As Lupinranger Vs Patoranger comes to a close, Zi-O starts to achieve his full potential and the Super Sentai Saikyou Battle kicks off. The Lupinrangers are stuck inside Dogranio’s safe after their battle with Zamigo. Thankfully, they equipped their police counterparts before entering, knowing this could happen. On the whole, this final episode feels rushed. The battle against Dogranio is short and anticlimactic, decided quickly by a macguffin more than the skill or strength of any of the Rangers. When it’s over, Dogranio is taken into custody rather than being killed, and we flash forward a year. In that time, the Patorangers have become superheroes, celebrities to some degree, while still managing to do their jobs and mop up the last of the Ganglers. The Lupinrangers are believed to be dead, or at least, still trapped inside Dogranio’s safe world. When the credits start to roll on this series for the final time, the ending is ambiguous, a cliffhanger that leaves the main arc of the show unresolved. It is flashy, though, and does not disappoint if you are looking for good choreography and stunt work. Where it does fall short in one other big way, though, is that the final scene of the series undoes much of the growth the characters went through, ignoring previously established friendships and romances, in favour of the generic cops-and-robbers angle that began the series. With a movie coming later in the year, I am personally hopeful that that will provide the ending this amazing series rightfully deserves. 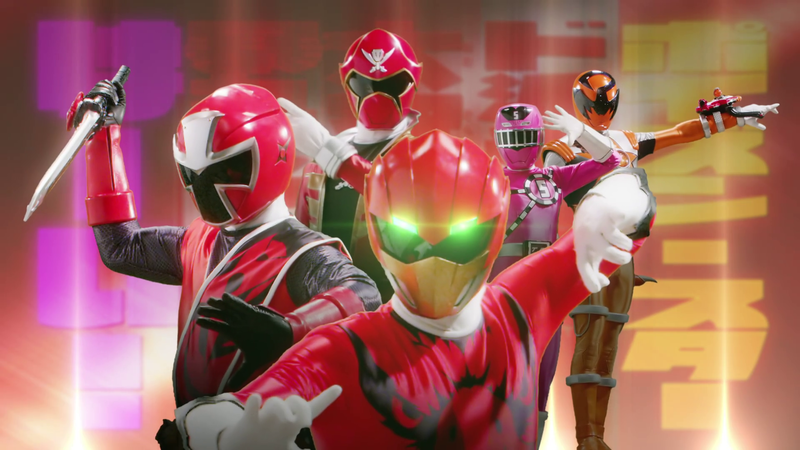 Kishiryu Sentai Ryusoulger kicks off in a few weeks, but until then, we are going to be treated to a four-week miniseries called Super Sentai: Strongest Battle! This series will be covered here during its full run leading up to the premiere of Ryusoulger. Zi-O’s true power is unleashed this week as Zi-O II debuts! 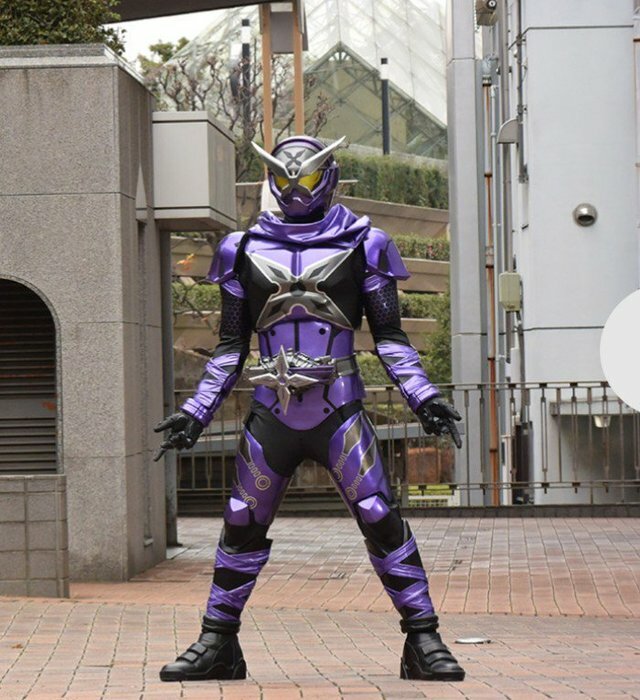 In an attempt to defeat Another Ryuga, Geiz sacrifices his life to use his finishing attack on Another Ryuga, knowing that there is a time distortion before the attack triggers. This leads to Sougo beginning to accept the darkness in himself, the way he’d convinced Kido Shinji earlier in the episode to do the same. Zi-O II is able to defeat Another Ryuga, and in a strong twist of character, Tsukuyomi and Geiz wrap the episode knowing they pushed Sougo in the wrong direction. They resolve to do better, and we begin the next episode, which sees Sougo jump 102 years into the future, to 2121. There he meets Kamen Rider Kikai, a parody of Shotaro Ishinomori’s other classic tokusatsu hero, Kikaider. Curiously, the episode is even called “Kikai da!” as an easter egg reference to this character. Kikai’s design is very reminiscent of Drive, to me, with similar eyes and helmet shape. Many of the parts are mechanical in nature, obviously meant to emphasize the “Kikai” or machine design. It’s a good suit, overall, and one that could easily be believed as a future Rider. When Sougo and Geiz end up meeting Another Kikai, it is the opposite of its counterpart, organic in nature instead of mechanical. The armour is largely made of wood, and instead of a person, Another Kikai appears to be some kind of Beetle that can reform itself by jumping from one tree to another. To put a twist on things, it’s revealed with a quick snippet of dialogue that this Another Rider was not created by any of the existing Time Jackers we know. Through animation and set pieces, as well as some expository dialogue by Kikai, we see a dark future that is worthy of its own series, if played out correctly, much like the previous Miraiders up to this point. One thing that threw me off at first, but quickly became one of the best parts of the episode, was the face and voice behind Kikai. The same actor who plays Kamen Rider Kikai was also recently seen as Zamigo in Lupinranger vs Patoranger, but seeing him play a hero is only briefly an odd transition. He plays the part well, and I personally would love to see more of this character and world, either through a spin-off or V-Cinema like Kamen Riders Shinobi and Quiz are getting. This episode holds a few more big twists that you will need to watch it to see, but the implications on the plot are staggering if managed correctly. Next week, we will see the resolution of the Kikai arc, as well as all three Riders working together for the first time. Stay tuned and leave your thoughts in the comments or on social media! 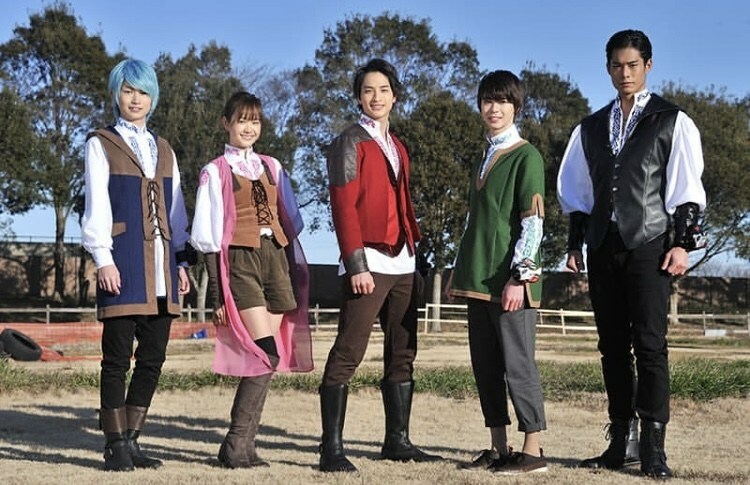 This three-episode miniseries is designed to fill the gap between the end of Lupinranger vs Patoranger and the beginning of the upcoming Kishiryu Sentai Ryusoulger, and is a crossover event between returning and new heroes. We begin with the defeat of the Gokaigers at the hands of the series’ villain, Gaisorg. The series features not only teams crossing over, but dimensions, as we see the team lineup debut. The team includes Gokai Red, Zyuoh Eagle, AkaNinger, Kyuranger’s Sasori Orange, and Toq # 5 (Pink). All of the original actors return, though the voice for Gokai Red’s suited form in the opening is clearly not Ryota Ozawa. Keiichiro of the Patorangers is also invited to join, but we are still given no resolution to the cliffhanger ending of his series. Taking beats from multiple western media sources, each Ranger who is invited is given a literal golden ticket, then transported to a Marvel-style battle world, a planet called Nemesis. Each summoned ranger joins a team of five, for a total of 32 groups, and the contest is shown to be a battle royale tournament. Zyuoh Eagle regrets that he and Keiichiro are in the first match, thinking they would get along well, but knowing this is just a contest. The match is between “Team Weirdo” and “Team Serious Business” which both appear to be fitting names. Apart from this one-on-one contest, we see other matches going on with other teams, dating as far back as Denjiman and Turboranger. Many of the battles shown are between teams whose seasons had crossover movies, including TimeBlue against Gingaman Red. Overall, this crossover event appears to be riding the Battle Royale hype train, but is a fun ride nonetheless. If you need a Super Sentai fix in between series, this will get you through, but is largely lacking in substance, apart from the character interactions. In addition, it was confirmed that Power Rangers Beast Morphers will premiere on March 2nd on Nickelodeon in the US, with worldwide release to follow shortly after. A trailer debuted for Beast Morphers around 2/21/19, showing some of the differences between Beast Morphers and Go-Busters, as well as some of the effects and the new transformation sequence. It appears they are adding a crystal gimmick that didn’t exist in Go-Busters, but are otherwise leaving the scene largely unchanged. What did you guys think of this week’s shows and news? Leave a comment and let’s discuss! 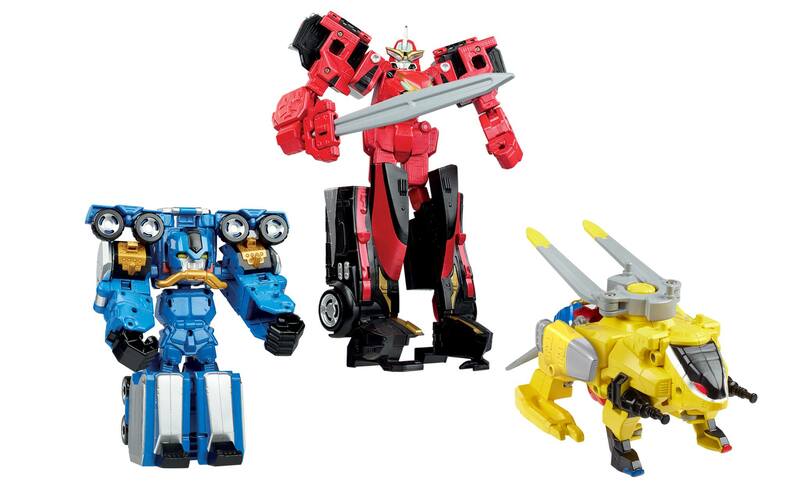 With Power Rangers Beast Morphers almost upon us, Hasbro have released further images of the new Zords and Megazord from the show, as well as a completely original toy in the Playskool line! Following on from last week’s initial Beast Morphers reveals, we now have more details about what the new zords and Megazord will look like. As you probably appreciate by now, Power Rangers Beast Morphers marks Hasbro’s first run at making toys for the franchise and boy are they coming out swinging! In a surprise move ahead of New York Toy Fair, Hasbro have been revealing their first Power Rangers lines in dribs and drabs; last week we saw the roleplay weapons to action figures and now they have shown off the new Zords, scheduled for release this Autumn. Hasbro has already stepped up to the plate, revealing two separate Zord styles where the majority can transform twice: between animal and vehicle mode. The Red Racer has the distinction of being able to transform three time, as it can also transform into a robot on its own. Without further ado, lets start by having a look at the Red Ranger’s Zord, the Beast Racer, in its three separate modes: vehicle, animal and robot. The Beast Racer Zord will also make up the basis for the Megazord when in robot mode. Next up are the dual changing zords which can change between vehicle and animal modes. These include the Beast Wheeler Zord for the Blue Ranger, Beast Chopper Zord for the Yellow Ranger, as well as two mystery/not so mystery Zords (Gold and Silver *cough*), one of which is known as the Beast Jet Zord. The Beast Wheeler in its vehicle and animal modes. The Beast Chopper in its vehicle and animal modes. The Beast Jet which has a vehicle form and an insect form. The Beast Wrecker is another mysterious Zord. When the bad guys go supersize, the Power Rangers need a way to keep up so they have the ability to bring their Zords together to create the Beast-X Megazord, made up of the Beast Racer, Beast Wheeler and Beast Chopper Zords. When they add in the Beast Jet and Beast Wrecker Zords, the Power Rangers create the powerful Beast-X Ultrazord. The Beast-X Megazord, created form the Red, Blue and Yellow Ranger’s Zords. For fans excited to see how the Playskool toy line will follow the Imaginext line for younger children, Hasbro also released some images of their newest addition to the collection: the legendary Red Dragon Thunderzord from Mighty Morphin’ Power Rangers. This behemoth of a Zord stands at approximately 14 inches tall and possesses lights, sounds and moving arms and wings, all of which are triggered by pressing down on the Thunderzord’s tail. If you place the exclusive Dragon Shield Red Ranger onto the Zord’s back, he reveals then unleashes hidden projectiles to defeat the bad guys. The Red Dragon Thunderzord is due for release around the same time as the Power Rangers Beast Morphers Zords, towards Autumn 2019. 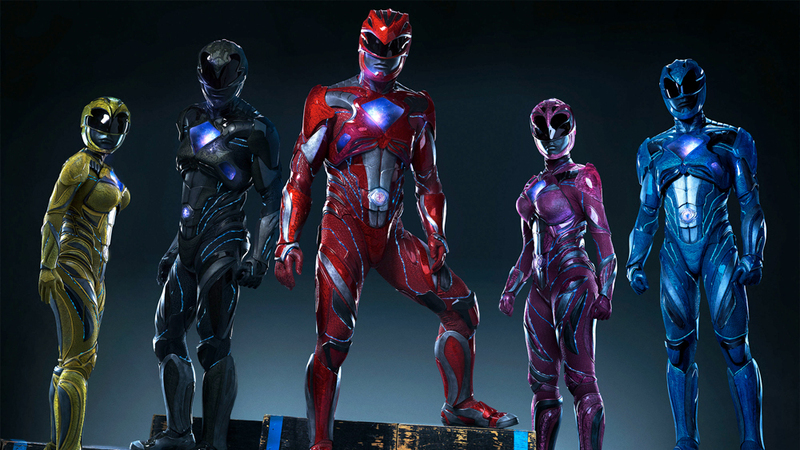 What do you think of the new Zords? Are you excited to see what Hasbro release next? Let us know on our social media pages! When attending a convention, nothing beats meeting a good guest! This is a list of all the upcoming Power Ranger guests due to visit the UK Convention scene throughout 2019. Toku Toy Store is happy to supply a list of all the guests attending conventions here in the UK, through 2019. Since we tend to go where the Ranger guests are, Toku Toy Store is also at the majority of these conventions. The list will be updated as more actors are announced. Let’s start with LFCC Spring, March 2nd & 3rd 2019, which will have Emma Lahana from Power Rangers Dino Thunder. Emma Lahana was born in Auckland, New Zealand on June 27th, 1984. She became involved in the arts at a very young age doing ballet and broadened her dancing to jazz, tap and modern styles. She also learnt to play the violin but once in high school became involved in drama as well as singing. It was here that she auditioned for a long-running New Zealand TV soap, Shortland Street (1992) and was surprised to be given the part of “Erin Kingston” which she played for 2 seasons. She performed in many lead roles in musicals for ACMT. In 2002, she starred in the Disney movie You Wish! (2003) and, in 2003, landed a lead role in Power Rangers Dino Thunder (2004) as Kira Ford/Yellow Dino Ranger. Following LFCC Spring is Carlisle Comic Con who will be hosting the suit actor of Alpha 5, Sandi Sellner. Sandi has had numerous roles in stage productions as well as working on several television shows, but is perhaps best known for playing Alpha 5 in seasons 2 and 3 of Mighty Morphin Power Rangers (1993). Up next is Liverpool Comic Con, March 8th, 9th and 10th 2019, which will have a total of 14 Power Ranger actors in total, including fan favourites Bulk & Skull. Jason Narvy was born on March 27th, 1974 in Los Angeles, California, USA. He is an actor and assistant director, known for having played the same character, Eugene ‘Skull’ Skullovitch, on seven different series: Mighty Morphin Power Rangers (1993), Power Rangers Zeo (1996), Power Rangers Turbo (1997), Power Rangers in Space (1998), Power Rangers Lost Galaxy (1999), Power Rangers Wild Force (2002) and Power Rangers Samurai (2011). Paul Schrier was born on June 1st, 1970 in Las Vegas, Nevada, USA as Paul L. Schrier II. He is an actor and director, known for having played the same character, Farkas ‘Bulk’ Bulkmeier, on seven different series including: Mighty Morphin Power Rangers (1993), Power Rangers Zeo (1996), Power Rangers Turbo (1997), Power Rangers in Space (1998), Power Rangers Lost Galaxy (1999), Power Rangers Wild Force (2002) and Power Rangers Samurai (2011). Steve Cardenas has been involved in the martial arts for 28 years (1986) since the age of 12. Steve is a 5th degree black belt in tae kwon do (as of 2014), and is a black belt in Brazilian jiu-jitsu. Steve owns his own jiu-jitsu studio in Burbank, California called Force Balance BJJ. He is best known for playing Rocky Desantos in Mighty Morphin Power Rangers (1993) and Power Rangers Zeo (1996). Selwyn Ward was born on June 13th, 1977 in Kokomo, Indiana, USA. He is an actor and producer, known for playing TJ Johnson in Power Rangers Turbo (1997), Power Rangers Lost Galaxy (1999), and Power Rangers Wild Force (2002). Blake Foster was born on May 29th, 1985 in Northridge, California, USA as Blake Anthony Foster. He is an actor, known for playing Justin Stewart in Turbo: A Power Rangers Movie (1997), Power Rangers Turbo (1997) and Power Rangers in Space (1998). Tracy Lynn Cruz was born on January 29th, 1976 in Orange County, California, USA. She is an actress, known for playing Ashley Hammond in Power Rangers Turbo (1997), Power Rangers in Space (1998) and Power Rangers Lost Galaxy (1999). Jason Faunt grew up just outside of Chicago. A talented athlete, Jason almost became a professional baseball player. Instead, he came out to Los Angeles to pursue an acting career. Jason makes his professional debut in Power Rangers Time Force as Wes Collins. Michael Copon is an American actor known for a variety of film and television roles including that of Lucas Kendall in Power Rangers Time Force. Beyond his film and television commitments, Copon is also a talented singer, releasing ‘Let’s Get Nasty’ on iTunes in 2010 and appeared (and subsequently won) the competition on VH1’s But Can They Sing? Kevin Duhaney was born on June 2nd, 1984 in Whitby, Ontario, Canada. He is an actor, known for Half Baked (1998), Honey (2003), Power Rangers Dino Thunder (2004) and Four Brothers (2005). Jeff Parazzo is a Toronto born actor with over 15 years of professional film & television experience splitting time between Canada and the United States. He was recently working on such shows as Flashpoint, Nikita, Degrassi and Suits. He is best known to his fans for his work as Trent Fernandes from Power Rangers Dino Thunder (2004). In 2016, Jeff was in the works with writing partners Kevin Duhaney & Luch Balao to bring their project “Trauma Con” to audiences around the world. Azim Rizk was born on September 4th, 1990 in Tucson, Arizona, USA. He is known for his work as Jake Holling in Power Rangers MegaForce / Super Megaforce. Ciara Hanna got started in the entertainment world when she was at the young age of 8. She travelled around Southern California singing with a local singing group, which entertained at such places as Knott’s Berry Farm, Royal Caribbean Cruise liner, and Universal Studios. She then pursued an acting/modelling career at 10. She starred in a few local plays before landing her first professional job doing a series of commercials overseas for the United Kingdom. Ciara Hanna also most recently played Gia Moran for Power Rangers Megaforce (2013). Nico Greetham was born in Woodbridge, Virginia to his Scottish father, Chris, and his Colombian mother, Isabella, both Physical Therapists. He has two sisters, Gabriella and Natalie Greetham. Nico grew up training as a competitive dancer at local dance studios, receiving numerous awards and titles in nationwide competitions. In 2016, Nico finally decided to pursue his lifelong dream of becoming an actor, by taking multiple acting classes in the Los Angeles area. Within 6 months, he landed his first role as Calvin Maxwell in Power Rangers Ninja Steel (2017-2019). Zoë Robins was born on February 19th, 1993 in Wellington, New Zealand. She is an actress, known for The New Tomorrow (2005), The Shannara Chronicles (2016) and Power Rangers Ninja Steel (2017-2019). Following on from Comic Con Liverpool is Medway Comic & Screen Festival, March 30th, at Medway Park in Gillingham who will be hosting Johnny Yong Bosch and Nakia Burrise from Mighty Morphin Power Rangers, Power Rangers Zeo and Power Rangers Turbo. Johnny Yong Bosch was born on January 6th, 1976 in Kansas City, Missouri, USA as John Jay Bosch. He studied Shaolin Kung Fu in Texas under Master James Clark. Master James Clark showed him an advert in the newspaper about an audition for Mighty Morphin Power Rangers, where he subsequently got his start in film. He is known for his work on Akira (1988), Mighty Morphin Power Rangers (1993), Mighty Morphin Power Rangers: The Movie (1995), Power Rangers Zeo (1996), Power Rangers Turbo (1997) and Bleach (2004). Growing up in Stockton, CA, Nakia Burrise was introduced to musical theatre and performance in elementary school. She began performing acrobatics by the age of five and later ventured into theatre, musical theatre, dancing, singing, and modelling. While attending Edison High School in Stockton, California, Nakia auditioned for UCLA’s prestigious theatre department. She was the only African American female freshman accepted into the theatre department that year. By the time she was a junior at UCLA, her professional career had begun. She booked her first role as a series regular on Power Rangers, as Tanya Sloan, the yellow ranger; while simultaneously recording her first pop album with her singing group, Divine. She has played an array of characters in various television series, movies, animated series, and commercials. She is best known for Power Rangers Zeo (1996). Continuing the MMPR theme, next up is Em-Con Nottingham, 4th & 5th May, who will be visited by Amy Jo Johnson and Jason David Frank. Amy is a multi-faceted artist with over twenty years experience in the entertainment industry. Working successfully as an actress for more than two decades, Johnson is most known for her roles as Kimberly Hart in the iconic series Mighty Morphin Power Rangers, Julie Emrick on the critically-acclaimed series Felicity, and Jules Callaghan on the award-winning Canadian series Flashpoint. she is best known for Mighty Morphin Power Rangers (1993) and Mighty Morphin Power Rangers: The Movie (1995). Jason David Frank is well-known for his role of Tommy Oliver in Power Rangers. He is the voice of Emissary in Transformers: Titans Returns and brings Bloodshot to life in the highly-anticipated project Ninjak vs.the Valiant Universe. Always one looking for adventure, Jason shares his exciting life in the extremely popular series My Morphin Life, which is now in its fourth season. Arguably the most popular and famous Power Ranger, Jason’s character was only intended to be in ten episodes. Due to his popularity, he was morphed into the most amount of different rangers in the show’s twenty-four year history. He began as the Mighty Morphin Green Ranger, a bad boy turned good, and subsequently morphed into the Mighty Morphin White Ranger, Red Zeo, Red Turbo, and then returned in 2004 as the Black Dino Thunder Ranger. He is best known for Mighty Morphin Power Rangers (1993), Mighty Morphin Power Rangers: The Movie (1995), Power Rangers Zeo (1996), Power Rangers Turbo (1997), Power Rangers Dino Thunder (2004) and Power Rangers Super Ninja Steel (2018). Second to last is Em-Con Worcester, September 14th, who will be playing host to David Yost. David Yost was born on January 7th, 1969 in Council Bluffs, Iowa, USA as David Harold Yost. He is an actor and producer, known for Mighty Morphin Power Rangers (1993), Mighty Morphin Power Rangers: The Movie (1995) and Power Rangers Zeo (1996). Last, but by no means least, is Inverness Comic Con, October 12th, who will have Brennan Mejia attending. Brennan Mejia is a professional acrobat turned actor, and has been performing since he was a kid. Best known for his role as the Red Ranger In Power Rangers Dino Charge and Dino Super Charge, Brennan has also worked on a number of other projects such as: Supergirl, American Horror Story Murder House, Kickin’ It, iCarly, Kaboom, Life In Pieces, The Secret Life Of The American Teenager, CSI Miami, American Ninja Warrior, and many others. Aside from performing, he also has a passion for health and wellness, and has a B.S. in Kinesiology, as well as certifications in fitness, yoga, and nutrition. That’s it for now! If and when more actors are announced as coming to the UK, we will update the list as soon as possible. What do you think of all the guests so far? Who would you like to see at a convention? Let us know on our social media pages! The plot of the first three episodes of the upcoming Super Sentai Strongest Battle miniseries have been revealed with a ‘Marvellous’ kick off! The summaries were revealed by Japanese site, AkkiNews, but were later translated by Rangerboard user, Dukemon. Kaizoku Sentai Gokaiger are suddenly attacked by a mysterious warrior named Gaisoulg. Captain Marvellous feels guilty of not protecting his team and crosses swords with Gaisoulg. During the fight, a mysterious “Shining Plate” appears, Marvellous/GokaiRed touches it and is transported to Planet Nemesis. He then discovers that many Sentai heroes from the past received that same plate, and have all been called there. The heroes were gathered by the Watchman of Time, Rita. She informs the heroes that she gathered them to participate in the “Super Sentai Strongest Battle” and the winners will be able to ask for any wish they desire, using her miraculous powers. With each hero having their own wish to fight for, they are divided into 32 teams of 5, mixing and matching the various Sentai teams. The first match is between Zyuohger’s Zyuoh Eagle and Patranger’s Patoren #1! In the middle of the battle, Gaisoulg interferes and challenges GokaiRed to a battle. Ninninger’s AkaNinger is injured protecting GokaiRed from his attack. 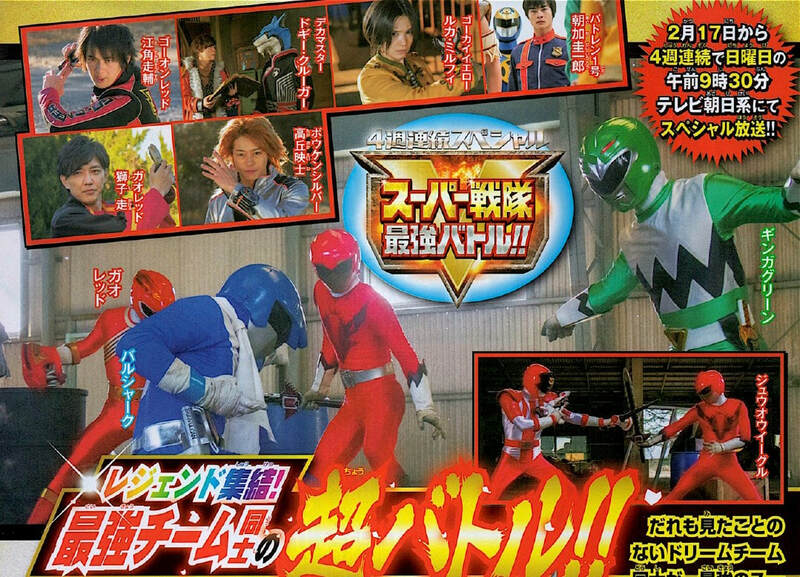 Dekaranger’s DekaMaster and ToQGer’s ToQ #5 are set to battle, but in fact, this fight is use to lure out Gaisoulg! What do you think about the special mini series? Are you excited to see a Ryusoulger be introduced outside of the new Super Sentai? Let us know on our social media pages! New York Toy Fair is right around the corner but Hasbro are already off the starting block with Beast Morphers toy reveals! 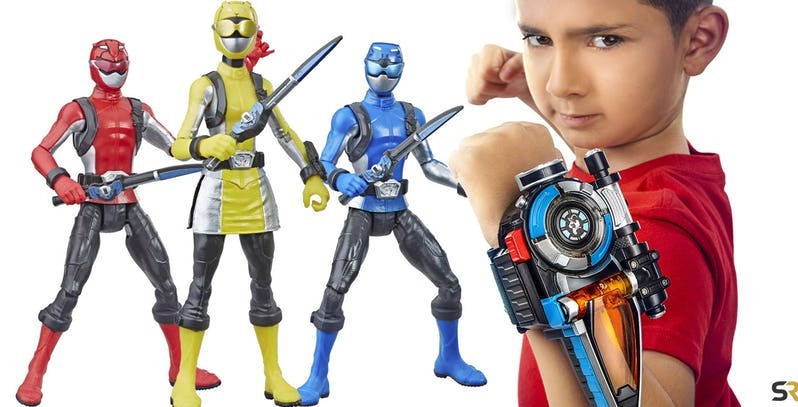 Continuing along the same theme, we also got images for some of the roleplay toys and costumes for Power Rangers Beast Morphers that will be seeing release. Kicking things off is a look the new Morpher from Power Rangers Beast Morphers, named the Beast-X Morpher. This wrist-mounted toy has lights and sounds built in as well as voice and movement activated features. Attaching it to your wrist and using the phrase “It’s Morphin Time!” will trigger the morphing sequence effects and swinging your wrist around will also activate battle lights and sounds for the toy. It also includes some Morph-X Keys which will also trigger lights and sounds. Other keys will be included with other toys from the series. Following on from the Beast-X Morpher is the Power Rangers Beast Morphers Basic Figures Assortment with each figure standing at 6 inches tall. Each feature multiple points of articulation and include two accessories so that fans can recreate the poses and scenes from the Power Rangers Beast Morphers series. Plus, with the included Morph-X key, kids can imagine unlocking powers in the Beast-X Morpher toy. Continuing from the figures are the new roleplay toys. The Beast-X Electronic Sabre features lights and reactive sound effects that respond to kids’ movements as they imagine battling monsters and villains as one of the Power Rangers. Swinging the sabre firmly 7 times unlocks “Beast Mode,” with special light and battle sound effects. The Cheetah Beast Blaster looks like a Cheetah Zord, ready to pounce, but can morph into blaster mode for soft dart-firing action! Powered by NERF, the blaster comes with 3 darts, ready for morphinominal action against any opponent. The Cheetah Blade looks like it’s ready for action with its cool plastic blade projecting from the mouth of the cheetah handle. The Electronic Cheetah Claw is used when the Red Ranger powers up in Red Fury Mode. The toy features reactive sound effects that respond to kids’ movements as they strap the toy to their hand, then make a slashing motion to extend the claws. Pushing a button on the handle makes them retract again, ready for more action. The Red and Blue Ranger masks both feature designs inspired by the TV show, so kids can imagine leading the Power Rangers in the battle to protect the Morph-X. From Halloween, to party time, or every day adventures, kids can imagine jumping into action. Last, but by no means least, are the fancy dress costumes designed for kids. What do you think of all the announced toys so far? What will you be adding to your collections? Let us know on our Social Media pages! Toei announces Kamen Rider Shinobi series; Quiz spin-off upcoming? Toei has recently revealed that a spin-off series, based on Kamen Rider Shinobi, is to be produced! The Kamen Rider Zi-O spin-off, Rider Time: Shinobi, will be made available at the end of March thanks to the Toei Tokusatsu Fan Club. The spin-off series will see Tawada Hideya reprise his role Kagura Rentaro/Kamen Rider Shinobi from episodes 17 and 18 of Kamen Rider Zi-O. Within the series, Kamen Rider Shinobi is one of the Kamen Riders from the future that Sougo and his friends interact with. Kamen Rider Shinobi comes from the year 2022. The spin-off series is said to reveal the true nature of the character not seen in the main show. It will be directed by Kamen Rider Drive director, Shibasaki Takayuki. Fans are also told to look forward to a spin-off that will be announced at the Super Hero Festival KAMEN RIDER X SUPER SENTAI LIVE SHOW 2019 concert event, which will be held at the Nippon Budokan on January 23rd, 2019. The new production will be made available via the Video Pass streaming service in Japan. Information of a second spin-off has led fans to question whether the work will feature Kamen Rider Zi-O’s latest visitor from the future, Kamen Rider Quiz. It was announced recently that Kamen Rider Quiz will be portrayed by Suzuki Katsuhiro, whom Super Sentai fans may recognise as Sakurada Hiromu/Red Buster from Tokumei Sentai Go-Busters. What do you think of Toei making miniseries’ for Riders that appear in main shows? Who else would you like see get a spin-off series? Let us know on our social media pages!